We are two weeks into the Islamic holy month of Ramadan. 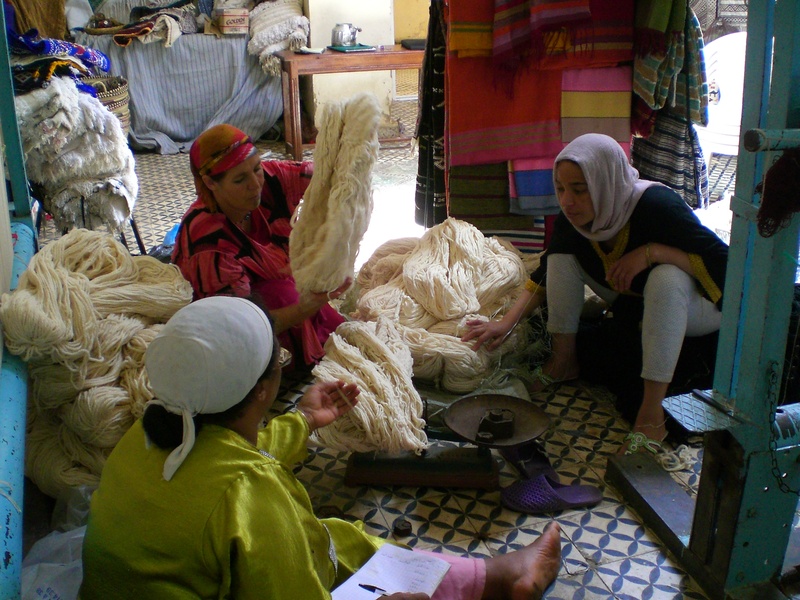 As a general rule, all Moroccans in Morocco are Muslim, so all of Ain Leuh and every member of the cooperative is celebrating Ramadan. This means observing a daily fast from dawn until dusk, over 12 hours during the heat of the day without food, water or cigarettes. Most people don’t even brush their teeth, to prevent any possible foreign substance from being swallowed. I am not Muslim, but I also fast most days. Since I am living with a family, it is just easier to do as they do. Work still continues on at the cooperative despite the heat and abstinence from food and water. I wake up at 8:30am and walk up the steep flights of stairs with Khadija to the cooperative while the rest of Ain Leuh is still asleep. 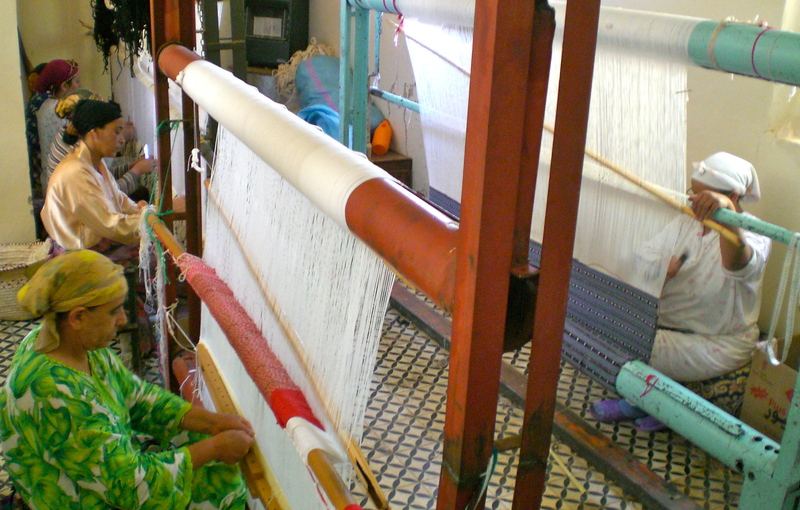 Most members of the cooperative are already there by the time we arrive and are working at their looms. The women of the cooperative busy at their looms. Weighing wool to be used in a large special order pile rug. The women take a break at 12:30 to pray the duhr, the noon prayer. During this time, I have been writing a few paragraphs on each woman who works regularly at the cooperative and photographing them at work. I’ve also been updating the website and Facebook page, teaching a few women how to take photos of their work, and showing them how to upload them onto their sites. Watch this short video about the wool we dyed today. The women work with surprising productivity despite the fast, but lose steam in the afternoon and head home around 3 or 4pm. After work, I pick a few items up at the market. 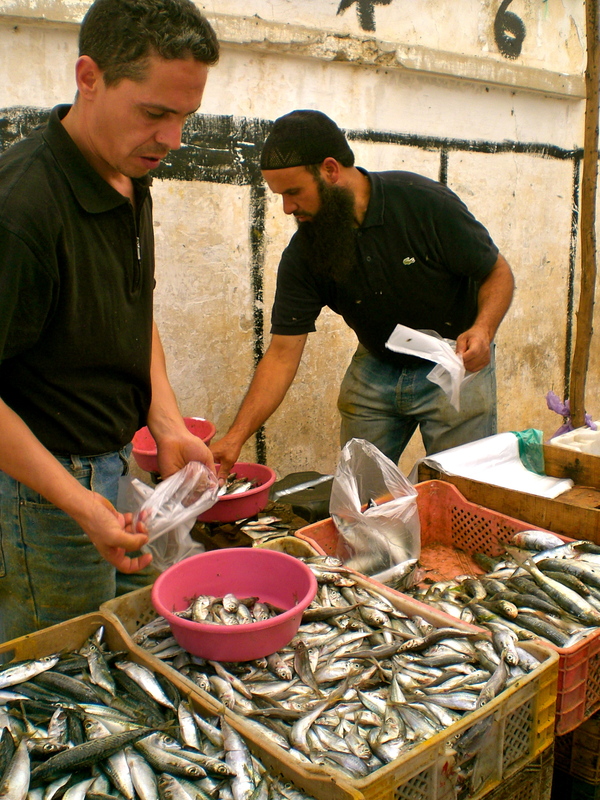 Once a week on Sunday, the very popular fish vendor from Rabat comes to Ain Leuh to sell seafood, a luxury item here in the middle of the mountains. I bought two pounds of sardines for about $1. Work doesn’t end once we return home from the cooperative. Before dusk Khadija is busy preparing the food to break the fast after the asr, the afternoon prayer at 4:30pm: she makes harira, a thick, tangy tomato-based soup and kneads dough for homemade bread and pastries. Traditionally, the fast is broken with a glass of milk, a few dates, and a cup of harira after the mugrub, the dusk prayer at 7:30pm. Most families get into the holiday spirit, though, and a typical Ramadan table can include two or three different types of breads, shbekia, fried dough soaked in honey, boiled eggs, fresh juices, coffee, tea, olives, cheese, butter and honey. The night prayer, the asha, is called around 9:30pm. I like to sit on the front steps in the cool evening air and watch the men and women of Ain Leuh slowly make their way to the only mosque in town. Because of her bad leg, Khadija takes 30 minutes to pray the asr in her living room. The rest of the evening is spent visiting with friends and neighbors or relaxing in front of the television; there are a number of serials put on especially for Ramadan that everyone follows. A small dinner is eaten at 1:00am, although I am usually already asleep by then. Khadija then has about two more hours of sleep after the dawn prayer, fjr, before she must get up and make her way to work.